YAY !!! Broke up for the holidays on Friday - yippeee yay !!! I really need this rest - so much has been happening in school. We've had ongoing racial disputes with pupils for a while now, but more recently the tension has been mounting and mounting. There have been fights nearly every day and I was first on the scene to one particular nasty fight and ended up getting a couple of kicks and a punch trying to separate it. Not nice. Anyway, I've been joining in with the Cyber Crop weekend on Scrapstars this weekend. I only found the site on Friday courtesy of Angela @ Angel Crafts, and I have been really warmly received. Their Cyber Crop has been going on all week and runs into next week again, but the climax was this weekend. 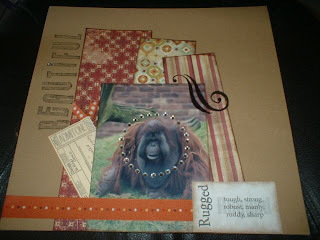 The layout above is one of the digi-projects that I took part in - but used stash instead. I don't know what it is about digi-scrapping, but I can't do it, and I just don't think I could get my ahead around not being able to sniff and stroke my stash !! !